that was to follow in the Dancehall period of Reggae. 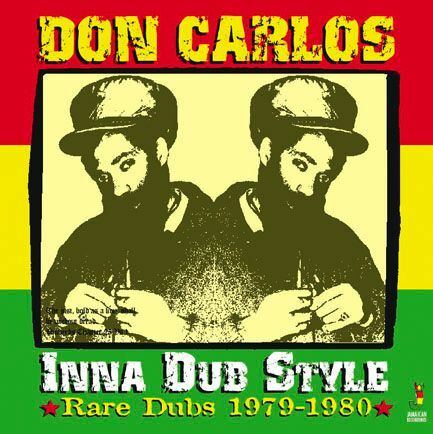 Born Don McCarlos, in the notorious Waterhouse district of Kingston, Jamaica. Simpson he formed what would become one of reggae’s foremost contenders, Black Uhuru. Their first recording would be a version of Curtis Mayfield’s ‘Romancing to the Folk Song’. Released under the name Uhuru [ the Swahili word for Freedom ] on the Top Cat label. matching Don’s collection of tunes against some of Bunny’s finest rhythms. star soon to be set in the 1980’s Dancehall period, we find this set hard to beat. We hope you find some magic as we have unearthing and compiling these lost treasures. 1. SPREAD OUT IN DUB. Dancehall scene.Where he works over the ‘Queen of the Ghetto’ rhythm in fine form. 2. MY BRETHREN IN DUB. A dub cut to Don’s ‘My Brethren Party’, which utilises Slim Smith’s ‘Give My Love’ as it’s backdrop. This is a lost cut to his ‘Ababa John I’ track in which he works the ‘Real Rock’ rhythm. 4. I’M GONNA MAKE YOU LOVE DUB. Don on his ‘Praise Jah with Love and Affection’ cut, of which this is a lost dub. him working over the famous ‘Drifter’ rhythm. Don works over a rhythm that Johnnie Clarke used for his track ‘Lego Violence’. Don’s version was called ‘Back Way with Your Mix Up’ of which is a cut to. A cut to a classic rhythm that Alton Ellis had used on his ‘I’m Just A Guy’ track. Don reworked it to became ‘Booming Ball’ ,this is it’s dub. Derrick Harriott, became Don’s ‘Groove with Me’ of which this is a cut to. 10. BABY DON'T CARE FOR DUB. works over Slim Smith’s ‘My Conversation’ rhythm. Jimmy Riley, and now hopefully it will now be remembered for this version. 12. TOO LATE TO DUB. and later a cross over hit for Boney M. Here brought back and given a roots biblical feel....Nice. 4. BABY DON'T CARE FOR DUB. 6. TOO LATE TO DUB. Sly Dunbar, Carlton ’Santa’ Davis; Drums. Robbie Shakespeare, Errol ’Flabba’ Holt; Bass. Earl ’Chinna’ Smith: Lead Guitar. Earl ‘Wire’ Lindo: Rhythm Guitar. Keith Sterling, Jackie Mittoo: Piano. Bobby Ellis, Tommy McCook: Horns. Rhythms Recorded at: Channel 1, Harry J’s Studio’s. Voiced at: King Tubby’s Studio. Photography: Maverick, Jah Floyd Archive. All Titles published by: Greenwich Farm Music. Manufactured under License from E. Lee.